There is a famous sentence in this week’s sidra: V’asu Li mikdash v’shachanti b’tocham, “Let them make Me a sanctuary and I will dwell in their midst” (Ex. 25:8). 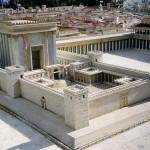 The sanctuary is one of the six “holies” in Judaism – the Holy God, the Holy Land, the Holy Book, the Holy People, the Holy Temple and the Holy Tongue. All share the unique characteristic quality of holiness, which – deriving from the root k-d-sh – means “to be set apart”. All the “holies” were holy from before Creation. The Holy God says about the Holy Land, “To your descendants have I given this land” (Gen. 15:8) – note the past tense, “I have given”. The Holy Creator is concerned with the entirety of His world, but has given the Holy Land of Israel special dimension of Divine care and concern. The Holy One loves all His creatures, but His Holy Presence dwells particularly within the Holy People. Yet there is a rider, a condition, a paradox. Apart from God Himself, none of the “holies” is entitled to proclaim its specialness. Each one is under notice, as it were. They have to deserve their holiness. If they prove unworthy they can lose their Divine quality and prestige. Holiness is their challenge, not their right. WordPress generated this page with 31 queries, in 0.210 seconds.